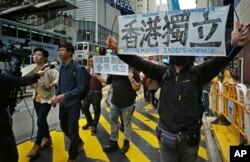 FILE - Protesters with placards and flags against an extradition law march toward the government headquarters in Hong Kong, March 31, 2019. Hong Kong took its first steps this week toward allowing extraditions to China, prompting warnings from across the political, legal and economic sectors that it could have significant legal and economic repercussions for the autonomous Chinese city. The bill is opposed by the city’s democratic lawmakers who say Beijing could use any number of “crimes” to extradite activists, journalists and other political troublemakers despite assurances from Secretary for Justice John Lee. “The fundamental bit is we have no trust and no confidence in the judicial and legal system on the mainland and if they want to play ugly, dirty whatever they can name anyone – you or me– for any packaged any coated – politically coated – crime and extradite you back to the mainland,” said democratic legislator Claudia Mo. Lee recently told reporters that Hong Kong would not extradite for crimes linked to “political opinion, religion, nationality or ethnicity.” Crimes must also be punishable by at least three years in prison for them to be considered for extradition, he said. 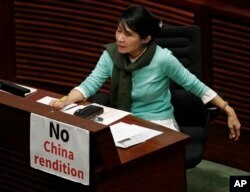 FILE - A lawmaker displays a placard to protest an extradition law at the Legislative Council, in Hong Kong, April 3, 2019. Beijing, however, often uses charges like tax evasion and other economic crimes to prosecute human rights lawyers and activists. Hong Kong’s Security Bureau removed nine economic crimes from an original list of 46 extraditable offenses following negative feedback from the business community. But even these changes have failed to assuage fears. “It seems to me the concerns reflect the anxiety about the actual criminal justice system in the mainland and how adequate this is to protect people who have fallen afoul of it,” said Philip Dykes, chairman of the Council of the Hong Kong Bar Association. FILE - Protesters against an extradition law hold banners reading "Hong Kong Independence" during an anti-extradition law march toward government headquarters in Hong Kong, March 31, 2019. The Bar Association has also questioned whether the bill’s “case by case” approach to extradition would become the de facto law between Hong Kong and China, sidestepping input from the legislature that would be required in a long-term agreement. While Hong Kong returned to Chinese sovereignty in 1997, it “deliberately” did not sign a long-term agreement with Beijing at the time because of the “fundamentally different criminal justice system operating in the mainland,” according to the Bar Association. Changes to Hong Kong’s extradition laws, however, were motivated by a dramatic murder case last year when a Hong Kong man allegedly killed his pregnant girlfriend while on holiday in Taiwan.